The term “ambulance medic” can be confusing for many people because it is a generic term used to describe emergency medical responders staffing an ambulance. However, there are actually two basic categories of ambulance medic and virtually every community around the nation. The first emergency service personnel arriving at an emergency scene, who may or may not have emergency medical training. A public safety professional with basic life support training similar to an emergency medical technician (EMT), with first responder certification. 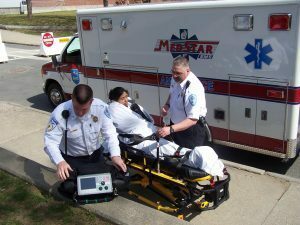 An ambulance medic, however, must at least be certified as an EMT and often has more advanced training as an EMT-paramedic, typically called simply a paramedic. As an ambulance medic, the biggest differences between paramedics and EMTs are the training and what they are allowed to do. In Massachusetts, Basic EMTs typically receive a minimum of 110 hours of training while an EMT-Advanced receives 185-220 hours of training. Paramedics get anywhere from a little over 1,000 hours to 1,800 hours of training and are often awarded two-year degrees. So what’s the difference between an EMT and a paramedic? Put in the most simplest of terms, paramedics’ scope of practice allows them to “break the skin” – that is, they can give shots and start intravenous lifelines and are trained in the use of 30-40 medications. Basic EMTs usually control bleeding, administer supplemental oxygen, perform CPR, and use automated external defibrillation machines (AEDs). Advanced EMTs have increased assessment abilities, can administer some medicines, begin IV therapies, among other skills. Paramedics can clean wounds, transport critical patients from one hospital to another with a very wide variety of infusions. They can also operate mechanical ventilators, provide endotrachial intubation, and interpret and monitor ECGs. among a more extensive range of treatments. If you’re interested in more information about ambulance medics or applying for an ambulance medic job, contact MedStar today.